Johnson Controls Delkor Battery Corporation was awarded the No. 1 quality company under the automotive battery category from KSA (Korean Standards Association) for 11 consecutive years. The KS-QEI award ceremony was held at Lotte Hotel in Seoul, Korea on 27 September 2016. Many journalists were present at the ceremony. Here are the publications from two most popular newspapers in Korea; Maeil Business Newspaper and Dong-A Ilbo. Johnson Controls Delkor Battery Corporation is world’s biggest car battery manufacturer with their operation in Gumi, South Korea. 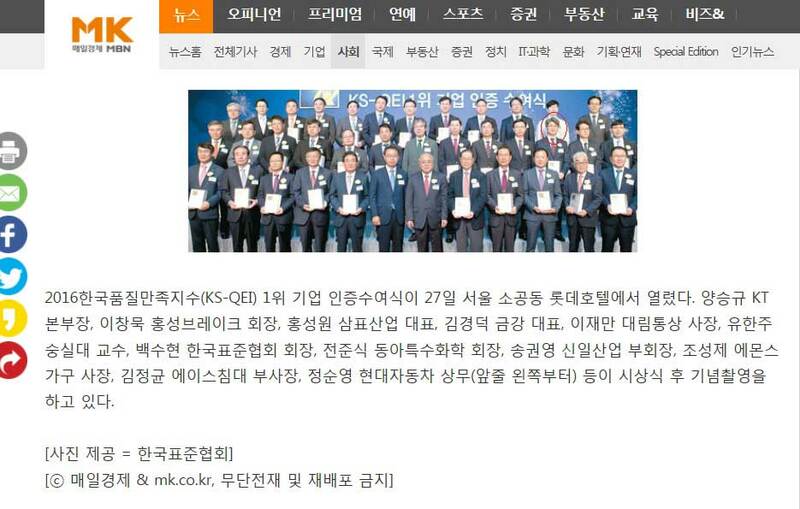 The company has been selected as the No.1 company in car battery criteria by Korean Standards Association for 11 years in a row. One of the main feature of Delkor battery is its patented stamped-grid technology. It has established its reputation as a “Total Battery Maker” that manufactures and sells the world’s best calcium MF battery. MF battery eliminates the need to replenish distilled water throughout the life a battery with more than 30 years of experiences in the local industry. It is the first in Korea to import and supply battery handlers. That had made installing car battery an easier task than ever. Its patented grid technology provides excellent starting power, higher cycling capability and reliability, for advanced Start-Stop vehicles with regenerative braking systems. Delkor AGM battery has been used as the bench-mark product by competitors in Korea. Apart from providing excellent battery power and performance, their grid technology also uses 20 percent less energy and releases 20 percent lower greenhouse gas emissions than other manufacturing methods, contributing to a better environment. To meet the increasing growth in demand for automotive batteries in the long run, Johnson Controls Delkor Battery Corporation invested in a second factory in Korea, Gumi GongDan area in 2012. This resulted in employment of 200 new employees and increased annual production capacity up to 12 million units, to strengthen their position as the #1 global company in automotive industry. In order to challenge and achieve zero defect rates, they implemented a system to perform automatic inspection of all products. Their best effort is rewarded with their customers’ satisfaction. They have been awarded GM Supplier Excellence Award by General Motors Global for 2 consecutive years since 2015. Johnson Controls Delkor Battery Corporation manufactures Korea’s best calcium MF battery. MF battery eliminates the need to replenish distilled water throughout the life a battery. Johnson Controls Delkor Battery Corporation has been selected as the No.1 company in car battery criteria by Korean Standard Association for 11 years in a row. Their Delkor brand AGM battery which uses their patented grid technology provides excellent starting power, higher cycling capability and reliability, for advanced Start-Stop vehicles with regenerative braking systems. Delkor AGM battery has been used as the bench-mark product by competitors in Korea. To meet the increasing growth in demand for automotive batteries in the long run, Johnson Controls Delkor Battery Corporation invested in a second factory in Korea, Gumi GongDan area in 2012. This resulted in employment of 200 new employees and increased annual production capacity up to 12 million units, to strengthen their position as the #1 global company in automotive industry. Johnson Controls Delkor Battery Corporation is part of Johnson Controls Power Solutions with global headquarter in Milwaukee. Johnson Controls Power Solutions is the world’s largest supplier of vehicle batteries, producing 146 million batteries – one-third of the industry’s output – every year. Renowned and recognized as the best quality battery maker, Johnson Controls Delkor Battery Corporation is constantly improving to meet their customers’ evolving needs. Johnson Controls Delkor Battery Corporation adheres to global product and process standards to ensure quality in its evaluation system and strict compliance, from raw materials production by suppliers to internal manufacturing process, inspection and shipment. In order to challenge and achieve zero defect rates, we implemented a system to perform automatic inspection of all products. Their best effort is rewarded with our customers’ satisfaction. They have been awarded GM Supplier Excellence Award by General Motors Global for 2 consecutive years since 2015.